Hellenic Antidote: Why did Greece want to overthrow Makarios? Why did Greece want to overthrow Makarios? I was reading a very interesting article on the infognomonpolitics blog, written by Marios Evriviades and which originally appeared in the Cypriot daily, Phileleftheros. Evriviades argues that the 15 July 1974 coup against Makarios was not necessarily a hastily concocted putsch by the junta, but the culmination of 10-years of Greek state policy. Greece, during this period, Evriviades says, was determined to come to an agreement with Turkey on the partition of Cyprus and was prepared to contemplate the forced removal of Cyprus’ president, Makarios, and the dissolution of the Republic of Cyprus, in order to accelerate its aims. I’ve translated below the first part of Evriviades’ article, which suggests that even if the goal of removing Makarios remained the same, the reasons for Athens wanting it done in 1964, under the premiership of Giorgos Papandreou, were different to those that motivated Dimitris Ioannides, the head of the junta, in 1974. Just to add that the more I find out about Greece’s official policy towards Cyprus in the years leading up the coup and Turkish invasion, the more I am struck by the breathtaking incompetence and stupidity of Greece's policy makers, and this applies to those associated with the junta and those who ran Greece before the colonels seized power. In fact, one of the reasons the story of Greece’s betrayal of Cyprus remains of interest, is because this same incompetence and stupidity continued in Greece after 1974 and is responsible for the sweeping crisis affecting the country right now. I’ll try and post further translation of Evriviades’ piece later this week. The betrayal of 15 July 1974 was the culmination of 10-years of scheming by Greece. However, the reasons for the scheming during this period change. In 1964, when the scheming starts, the aim and target of the coupists was the overthrow of the Makarios government and the dissolution of the Cypriot state, with the rationale of preventing Cyprus from becoming another Cuba, of becoming communist. In 1974, the aim of the coupists was more simple. It was the survival of the regime in Athens. Junta leader Dimitris Ioannides and the rest of his gang organised the coup in order to buy time from their transatlantic patrons and to appease the Turks and prime minister Bulent Ecevit, who were threatening Greece in the Aegean. By overthrowing Makarios – the ‘devil-priest’, the ‘red-priest’, the ‘anti-Greek’ – the junta believed it was providing a service to Washington and Ankara, who would be duly grateful. 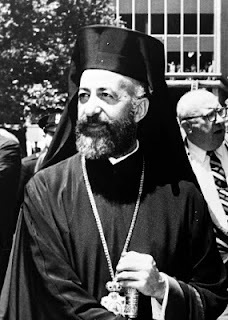 Ioannides believed the Americans would press Turkey to react to the coup with moderation since it was Athens’ intention, with Makarios out of the way, to sit down with the Turks and ‘close’ the Cyprus problem, which Greece and Turkey had been discussing intermittently from 1964, on the basis of the US-inspired Acheson plan, which envisaged partition of the island. A second motive the Ioannides’ junta had for wanting to be rid of Makarios was that in doing so it would end the threat posed to the Athens regime by the democracy that existed in Cyprus. In the paranoid world of the Athens junta, Cyprus was a haven for dissidents conspiring against the regime ruling Greece; dissidents, particularly those made up of former officers from the Greek armed forces, who, the junta believed, were being aided and abetted by Makarios. For more of this article, go here.